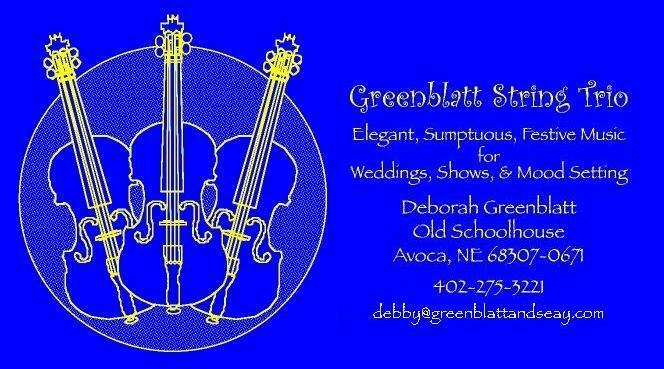 Provide an elegant touch for your wedding, reception, dinner, anniversary, prenuptial, or other special occasion with the Greenblatt String Trio. The Greenblatt String Trio. offers a wide variety of traditional and non-traditional tunes to provide the perfect tone for each part of your ceremony from the seating of the family all the way to the Postlude. On the day of the wedding, about half an hour before the ceremony starts, the Trio can initiate the ambience with light background music while your guests are being seated. During the ceremony your pre-selected tunes can be played at the pre-appointed times. After your recessional the Trio can keep the mood going while your guests gradually exit end even right through the reception. Brief String Trio audio samples are available to help you make tune selections. These sample tunes are presented in the order of activities at a wedding, i.e., candle lighting, seating of the family, bridesmaids, bride, recessional, etc. Click for Greenblatt String Trio wedding audio samples. Create a classy atmosphere for your formal or unformal gatherings at a volume level which will allow your guests to enjoy their conversations without shouting. In a formal concert setting the Greenblatt String Trio. can play a variety of classical and popular styles, including the music of Bach, Mozart, Joplin, Pachelbel, etc. as well as medleys of old-time tunes from various cultures such as Irish fiddle tunes with delightful and insightful commentary interspersed.